AS IT STANDS: Why Stop at Just Ugly Sweater Parties? I saw my son, and his girlfriend, on Facebook modeling ugly sweaters at an "Ugly Sweater" party, and it got me to thinking (always a dangerous proposition). 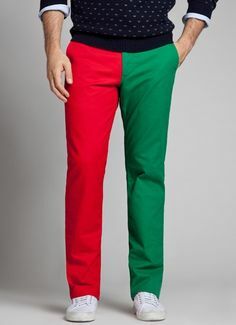 Why not have Ugly Pants Parties? My example here is just a suggestion. Imagine what you could come up with? We really should have Ugly Hat Parties. There's already Ugly People parties - I go to at least one every December. How about Elf parties? Cosplayers ought to really get into the spirit of things there. How about an Ugly Politician Party? That way none of them will be left out, because they're all ugly...in one way, or another.